is Bandfuse gonna plan on adding more DLC’s in the near feature? They don’t even have the DLC they added in the past. Given the Rockthrough video, it’s not a live version of Limelight. It had the Moving Pictures cover in the gameplay. They probably just didn’t have a good music video to go along with the song. That doesn’t really make sense, I’ll wait for 100% confirmation on that. Although the music video is live it is indeed the album version, thanks for letting us know! Confirmed via live stream. Can you source a few of these songs? Like, how do you know it’s a live version of Limelight? Where did I Want You To Want Me come from? You guys didn’t mention a bunch of these when they appeared on the setlist. Also, do you know which live version of Limelight it is? Rush In Rio? R30? We have no idea what version of the songs are being used, just guessing. Megadeath and Bullet for my Valentine will also be in bandfuse. This article says “Soon after the release, game owners can add on over 125 more great tunes “. The Pixies Here comes your man will be on it. Release date for BandFuse: before November 28th. Will be available for pre-order very soon. They had me at Black Label Society, then added Roundabout by Yes -- I would buy for those two alone. Hell, I would buy just to have Roundabout! And Pantera’s I’m Broken -- Hell Yeah. As for the similarity of the Song List. 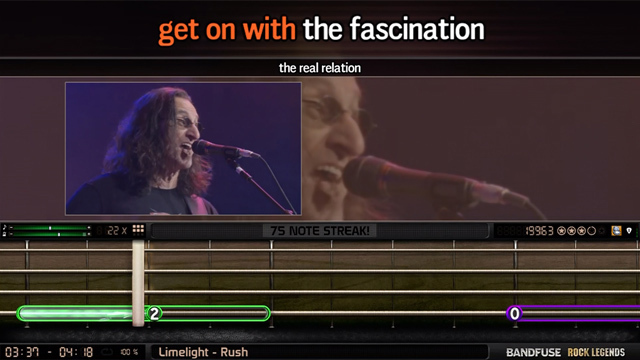 Have you not noticed how Rocksmith’s DLC have been pretty much matching this Bandfuse playlist? My guess is that Rocksmith is trying to bury the competition before the launch. Smart move by Rocksmith! I don’t know how effective it’ll be, though--there’s always been a lot of repeated songs among rhythm games, and I think people will be looking more at the gameplay, glitchiness, etc. than at the track list. Where does the source from the “TBA” songs come from? No, it’s just music licensing. Just out of curiousity, where did this song list come from? I ask because the official Bandfuse website only names nineteen songs (and, hilariously enough, they don’t bother to mention that it isn’t the whole list--kinda shooting themselves in the foot). They haven’t updated their website in awhile, these songs have been confirmed via articles and facebook, and studying their trailers for unannounced songs. Each “TBA” song has the source next to it. ROCKSMITH sold us all out with there freezing issues that they will not admit to nor will they fix. So come on 28 May. It’s about time someone came along and stoked the competition FIRE! Just me or does this look A LOT like the list from Rocksmith? I am not a basher and I hope that Bandfuse does well as I am very interested in it, but I am going to need a good reason to buy it. Unless the game just buries Rocksmith in playability / graphics / sounds / Sound effects, etc. this playlist is likely not going to get me to shell out the dollars to buy it. Here's hoping a lot of new / different songs are added to the playlist prior to release. BandFuse does offer something different with the Rocksmith "repeats" (so to say). The fact that the learning process will follow a graduated as opposed to dynamic difficulty, the addition of separate audio stems, and of course the tablature interface. Still songs to be revealed though, you are correct.